As your Leland’s Cabins home comes together, the next phase of construction kicks up the excitement. Our custom cabins are Texas made and Texas proud, which means pride in workmanship goes into each and every one. We don’t line it up for delivery until we’re satisfied that every step has been done right. We saw in Part 3 how the windows and roof take shape. Once the exterior is painted, it’s time to run in the electrical wiring. No matter whether you’re choosing our leaner models like the 216-square-foot Rio Bravo and 392-square-foot The Stag, or opting for our more luxurious 1,288-square-foot The The Ponderosa and 1,536-square-foot The Lodge, our cabin production time runs only six to eight weeks. Ceiling fans, laptops, gaming systems: our cabins can be used for a number of purposes. 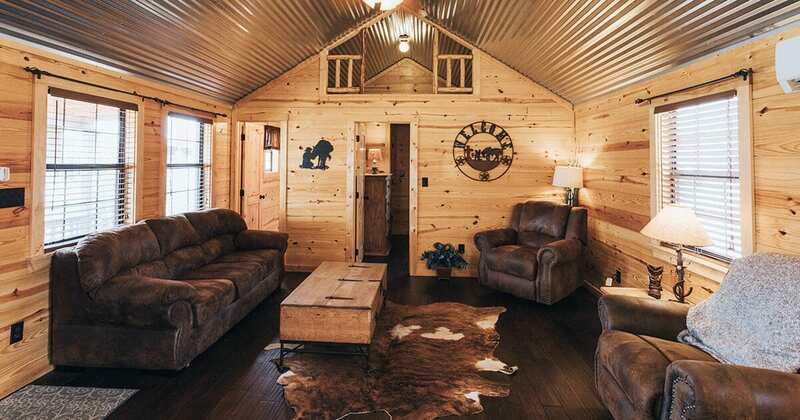 Some customers have selected their Texas cabin homes to serve as family getaways into nature. Others choose their cabins as artistic workspaces where they can have peace and quiet to create. And still others pick their cabin as an office space separate from homelife. Whatever uses you’ll find for your Leland’s cabin, we’ll get you wired up—and fired up—right. After the electrical is in place, we lay in the insulation. Texas summers can be brutally hot. A well-insulated home helps keep the inside cool and comfortable while keeping the heat out. And this means you save on the cooling costs. According to a Natural Resources Defense Council report, insulation can cut your cooling and heating costs by 15 percent. And while our winters are mild compared with other parts of the United States, we still want you feeling cozy and warm when the temperature plummets. One of our biggest points of pride is our cabin interior. When you choose a prefab log cabin like one of the nine cabin models we offer at Leland’s, you’re getting the finest in rustic retreats. Stepping into a Leland’s Cabin home, you’re greeted with the finest wood walls, floors, and cabinets. We bring nature indoors, so you never feel too far away from the natural world—whether your cabin is located near a babbling brook or just in your own backyard. Our cabins’ walls are made of ponderosa pine, a hardy and fast-growing tree common to the Western United States. We lay in the eight-inch panels in a shiplap or V-board pattern. Upgrade to white-washed or painted pine. Or choose our premium option of white pine wood for your walls. These finishes can set the tone for your interior styling. Choose a clear-coat finish for a crisp look. Or upgrade to our premium homestead deluxe finish. Our basic flooring option is Brazilian walnut laminate that is easy on the eyes and the wallet. Upgrade to our precious highlands flooring for a sleeker look and feel. Or go for our finest option, gorgeous wood plank, that will make you want to walk barefoot no matter the season. At Leland’s, we want you to customize your cabin so it ticks every box on your wishlist. Look for the next and final step in the process, Part 5: HVAC, Plumbing, Lighting, and Cabinets. And contact us to learn more about how we can get started on your custom cabin. Schedule a visit to our cabin center in Grandview, the largest cabin showroom in Texas, and we’ll have a glass of sweet tea ready for you. As with our cabins, we do things the Texas way.